A petition in support of legalizing medical marijuana in Mississippi has gained more than 3,000 signatures on campus. The petition, circulated by Medical Marijuana 2020, is part of a campaign to include a proposed state constitution amendment on the 2020 general election ballot that would allow for medical marijuana prescriptions in Mississippi. Medical Marijuana 2020 is a campaign based in Ridgeland with the ultimate goal of allowing Mississippians who suffer from painful medical conditions to have legal access to medical marijuana. In a previous interview with The Daily Mississippian, Jamie Grantham, the communications director for the campaign, said the ballot initiative process was approved on July 30, 2018, by the Mississippi Secretary of State and Mississippi Attorney General’s office, and the campaign has been collecting signatures ever since. Grantham said more than 60 local public figures from health care, religious and political fields have come out in support of the initiative. In order to earn the amendment a spot on the November 2020 ballot, the campaign needs to collect over 86,000 signatures, verified by local officials and the Mississippi Secretary of State, before September. Adam Meyer is the Medical Marijuana 2020 field leader who has been in charge of gathering signatures on the Ole Miss campus, and he said the petition currently has around 40,000 total signatures from across the state. Thirty-one states, including Pennsylvania, Colorado, Washington, California, Oklahoma and Florida, have all legalized medical marijuana. Myer said his goal is to add Mississippi to that list. Meyer said he hopes legalized medical marijuana will aid in ending the opioid crisis in Mississippi by providing an effective non-opioid option for pain treatment. In a study published in December 2018, the Center for Disease Control and Prevention found that an average of 130 Americans die every day from opioid overdose. 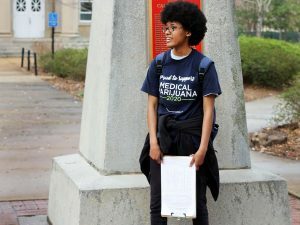 The Medical Marijuana 2020 campaign is targeting college campuses as a primary site for recruiting signatures because these campuses have large crowds and many students are more willing to participate than the average passerby, according to Myer. In addition to the social support for legalizing marijuana, various studies have shown possible economic benefits. The Institute of Cannabis Research at Colorado State University-Pueblo found that a legalized and taxed cannabis industry contributed over $58 million to the local economy. “I think it would be good, not only for the people that need marijuana for medical purposes but also for revenue and economic reasons,” Glenn said. State Rep. Dana Criswell of DeSoto said in a previous interview that he never expected to be a person who would come out in support of medical marijuana, but he realized this was because he didn’t understand the issue well enough. Director of Pharmacy Health Services Sandy Bentley said in a prior interview that every medication has some kind of risk, even when prescribed by a doctor. But the reason doctors prescribe the medication is that the benefits outweigh the risks. Medical marijuana is no different. Bentley also said that if the initiative passes, pharmacies would not be the ones who would dispense the drug because federal law prohibits pharmacies from distributing it.